Do you ever create a dish even you’re impressed with? 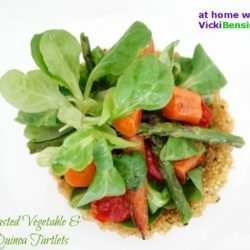 My Roasted Vegetable & Quinoa Tartlets wowed the socks off of me! Quinoa is a favorite grain in my house – a SuperFood packed with nutrition, high in protein, among other health benefits. Plus, when blended with your favorite ingredients quinoa takes on a myriad of flavors. Best of all, after eating a meal with quinoa my family always leaves the table satisfied and nourished. After viewing a tartlet in a magazine from a Paris restaurant, I decided to create my own that would satisfy even a gluten free diet. This pretty little tartlet is flavorful, delicate and perfectly contained in it’s quinoa crust. Although it looks complicated, it’s quite simple to prepare. Serve as an appetizer, side dish or entree. You’ll feel like you’re dining in another country. 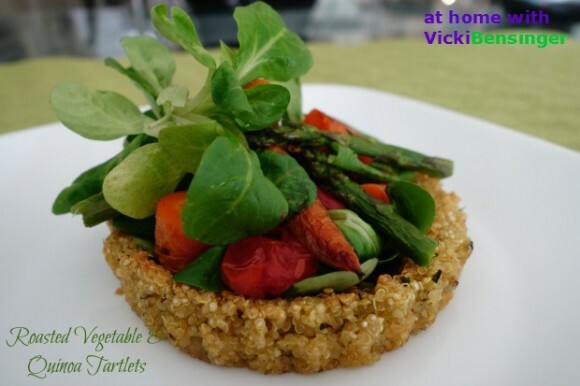 You'll feel like you're dining in Paris when you savor this Roasted Vegetable & Quinoa Tartlet! Sounds like this would be wonderful from brunch, lunch or dinner Vickie. Love all the healthy and delicious ingredients. Thanks Chris, it was wonderful! Mine too! It is so versatile. I actually love quinoa as a grain more than as flour. These tartlets looks great with roasted vegetables. They were delicious! I hope you’ll try them. What a tasty looking treat! Really creative recipe. Love the top photo! Thanks John. I shocked myself with that photo. Beats me what I did that it turned out so good. I actually impressed myself. Thanks for the compliment. It means a lot coming from you – a photo expert! 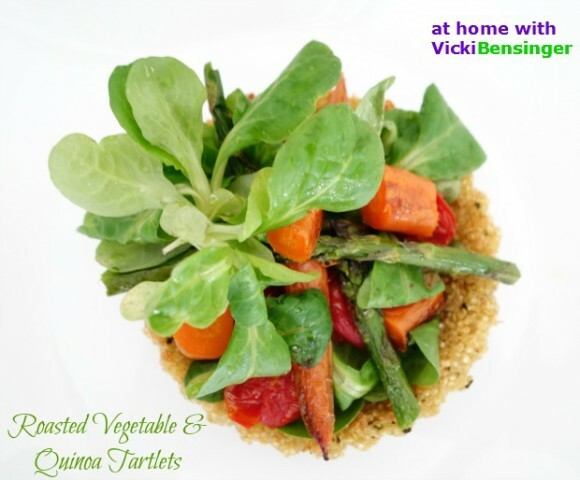 We love quinoa too, Vicki. 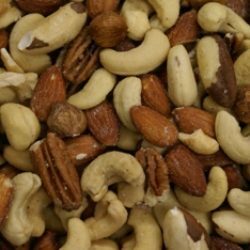 They are so delicious and good for you. Thank you Angie, they’re delicious too! Beautiful tartlets and how innovative, Vicki! Thank you Ela and they were fun to create as well. I love quinoa too and I’m always trying to find ways to create new dishes with it. This one was fun and I think turned out quite nice. What a lovely meal – so delicious and so healthy- could eat this every day! So could I. 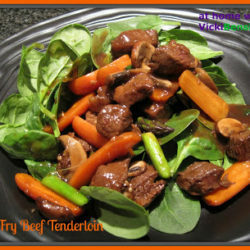 It was really easy to make as well and so tasty, not to mention healthy! 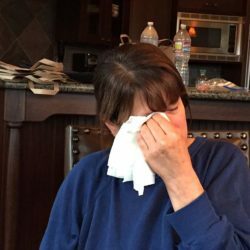 Oh my Vicki – what a great idea! We love quinoa and I find it lends itself to so many different kinds of dishes and this is a perfect example. LOVE it! I adore quinoa, too, and your tart shells sound fantastic! Then you filled them with roasted veggies…what a terrific idea! It was great. I could eat this for lunch, dinner or even at brunch. So yummy! What a fantastic idea, Vicki! The presentation is lovely also. Thanks Susan. I was actually thrilled with my photo. I can’t recall the last time one turned out so well. Maybe I’m actually learning how to work my camera! Love your salad very clever. I did not like quinoa when I tried it a year ago 🙁 may be I should try it again or find a sub. Thanks Vicki. I think that quinoa by itself is bland. However, when you add other ingredients to it, like shallots, broth, tomatoes, spinach, or whatever you prefer it becomes a wonderful dish that’s not just healthy but very tasty. I hope you’ll give it a try again. Quinoa is such a wonderful grain! I love the idea of using it as a crust. Your tarts look lovely with all those roasted veggies! Have a great weekend! Thank you I was really pleased with it as well. You definitely should, it turned out to be a wonderful dish. I was thrilled with the results. This would make a lovely starter when entertaining dinner guests. Absolutely! I hope you try it. If you do please let me know what you think. We all loved it. This is a great idea, Vicki. Quinoa is a true Super food and your creation looks tasty and is a really eye candy too. I can’t begin to tell you how pleased I was with my photo. I’ve been struggling with photography and while I’m not sure what I did to make this photo so lovely, I’d like to think maybe I’m learning a thing or two. 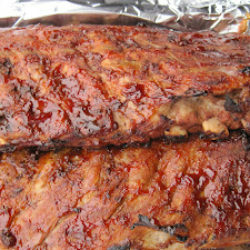 I hope you’ll try this dish – it was terrific! What a gorgeous preparation! I’d love to try this too. I hope you do, it was wonderful. Please let me know what you think if you do. What a creative and ingenious tartlet!!! The quinoa makes a great “pastry” for those roasted vegetables. It really did and it was so easy. It was a wonderful dish, so tasty and healthy. Certainly you could use the tarts for many things. I hope you’ll try this. A brilliant way to prepare Quinoa! Healthy and tasty, couldn’t wish for more.